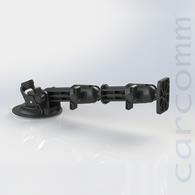 The CarComm Heavy Duty Suction Mount is the universal mounting solution to mount your Mobile Computer, Handheld Device, Smartphone or Tablet vehicle cradle in your car, van, lorry, forklift or truck. The Heavy Duty Suction Mount is suitable for installation on windscreens, dashboards or other non porous surfaces. The Heavy Duty Suction Mount consists of a 90mm Suction Base, a 116mm long socket arm, 104mm extension arm and a 26mm Ball Mount with the universal AMPS hole pattern. The AMPS Hole pattern on the 26mm Ball Mount is compatible with all CarComm Cradles and other AMPS compatible 3rd party cradles. The Heavy Duty Suction Mount can easily be adjusted to achieve the perfect viewing angle. The bottom of the 90mm Suction Base is coated with a polyurethane gel, which fills up small imperfections when using the mount on an uneven surface, providing a maximum surface bond. When the suction strength becomes less because of dirt, you can simply restore it by rinsing the pad with a mild liquid soap and warm water. Air dry the surface and it’s good to go. In order to prevent permanent indentation marks on soft vinyl, leather, or similar dash surfaces, CarComm recommends using the included Adhesive Disc with VHB Tape.